German Army M1943 field cap. Pattern 1943 field cap for a German Army officer (Einheitsfeldmutze). Made with the same fabric of the tunic of that time, has the classic silver piping on the top and the front badge with the eagle enbroidered with silver wire too, typical for officers caps. This pattern of field cap was introduced in June 1943. 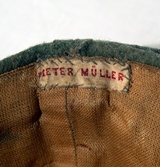 On the liner, in the back, the name of the owner on an enbroidered and stiched label: Dieter Muller. In very good condition. Very rare. Notify me of updates to German Army M1943 field cap.